Suspension upgrades and refinements are an excellent way to revitalise or improve the cornering performance of your Elise, Exige, 340R, 2-Eleven, or Evora for road, track or competition use. There are many ways to achieve this from simple replacement dampers with a correctly adjusted wheel alignment through to a “sports” or race suspension confirguration incorporating multi-way adjustable dampers with specific coil spring settings. Our suspension range includes the top names in aftermarket suspension development. A working understanding of these products and good relationships with the manufacturers allows us to provide our customers with the precise installation and accurate set-up for giving the best possible ride and handling experience. Whether you are looking for road, track or race equipment or setup we can help and advise you based on your requirements. An in-house 3D digital imaging wheel alignment system allows us to make micro adjustments to all aspects of your geometry and wheel-alignment. This allows your new suspension to be perfectly setup once installed. Road, track and race options are available in one-way, two-way and three-way adjustable formats and can be shipped via mail order or installed and fully set up by our experienced technicians here in our workshops. We can also offer track-side fine-tuning for our customers where we are able to help them get the best from their cars ride and handling after changes have been made. Alongside our range of Lotus suspension kits, we also offer adjustable anti-roll bars and rear toe-link kits to further refine the cars handling and increase durability. 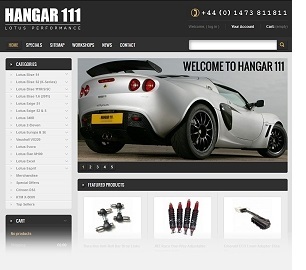 We are pleased to be the UK importer for JRZ Suspension Engineering for all Lotus applications. JRZ factory support during the 2012 Elise Trophy and Lotus Cup UK series helped us achieve 10 podium finishes and 8 1st place wins for drivers in our Lotus Elise 111R race car fitted with the JRZ Race One-Way Adjustable suspension kit. This success was continued with our S1 and new Cup R cars, through 2013 and 2014. For more information on our range of suspension upgrades visit our online store or contact us.